Ok so you might not know about the Mega Quarry but should you care? Hmmmm, good question? I get asked that a lot! I also know that a few of the people that follow my 365 things to do in Orangeville don’t live near here, but this is an important issue and I want to draw attention to this. Hello my name is David Waters and I’m one of the Organizers of FOODSTOCK. This is an event that you will not want to MISS! Here is a little summary of how we got here. Melancthon township is a small rural area northwest of Toronto, between Orangeville and Collingwood that is primarily farmland. Specifically, it is one of the most prolific potato-growing regions in Ontario and supplies the Greater Toronto Area with a large percentage of its potatoes. A couple years ago, a large corporation known as Highland Companies began buying up farms in this area, telling sellers they would continue with potato farming. They amassed a plot of 8000 acres, then submitted a proposal to the Ontario government to operate a limestone quarry on this land. Initially proposed at over 2300 acres this is by far the largest quarry to operate in Canada and they have been granted perpetual rights to draw a 600 million litres (enough for over 2.7 million people) of water per day from the area. The region is near the headwaters of the Grand River watershed and 4 others, which serves over a million people in Southwestern Ontario, including Kitchener-Waterloo, Hamilton, the Niagara region – as well as Guelph. The quarry will dig 230 feet below the water table so the potential for contamination of the whole watershed is HUGE!. This land is far from any major highway, yet they will be running 300 trucks an hour (7,200 a day in and out) carrying stone back and forth. While they intend to grow crops again on the quarry floor, this concept is laughable at BEST, as quarrying generates soil contamination and it is highly unlikely that this would even be possible. Further, this company, while supposedly Canadian, receives primary backing from a New-England based hedge fund, and neither company has ever operated a limestone quarry, let alone a Mega-Quarry. That tells me they will likely be bringing in an outside operator after approval, so any concerns regarding safety records will not be addressed. Furthermore, there is a loophole in the law saying that quarries do not have to undergo an environmental assessment to be approved. This land is located just outside the Greenbelt, a protected area that grows much of Ontario’s produce. Fortunately Ontario’s government has recently reversed course and has finally ordered an Environmental Assessment for the project. With this impending threat to our local food security, local Ontario chefs have come together to show solidarity with the protests against this mega-quarry. Leading this is celebrated chef Michael Stadtlander, one of the country’s best chefs and one of the strongest advocates of local, farm-to-table cuisine. The Canadian Chef’s Congress, of which he is the chairman, has organized a fundraising dinner at an area farm that did not sell out to Highland and we have billing this as “FOODSTOCK”, with the implied reference to Woodstock quite intentional. More than 90 chefs, including Stadtlander, Jamie Kennedy, and other top chefs will be present and contributing dishes. Unlike most celebrity chef charity events, that will usually cost more than $150 per person, Foodstock is a pay-what-you-can event. 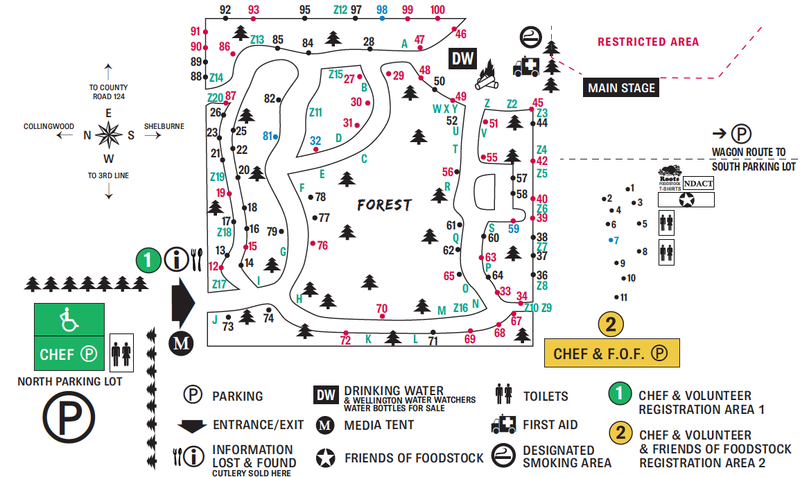 You can either register in advance at www.canadianchefscongress.com or pay at the gate – the suggested donation is a mere $10 PER person. Of course, since all funds go to support the cause, larger donations are obviously welcomed. This is a no-frills event – except for the FOOD and Awesome Music. Attendees should bring their own plate, cutlery, napkin and water glass. As this is on a farm and will go rain or shine, it is probably also a good idea to bring a chair and boots.